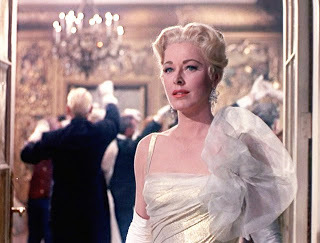 Eleanor Parker as the Baroness in “Sound of Music” (1965). Today’s audiences know her as the Baroness; the mean blond who was Julie Andrews’ romantic rival in “The Sound of Music” (1965). Though her role in the 1965 musical is memorable, the talents of Eleanor Parker are so much more than that. Parker started out at Warner Brothers studios in the early 1940s. She was fresh faced, pretty and red-headed. 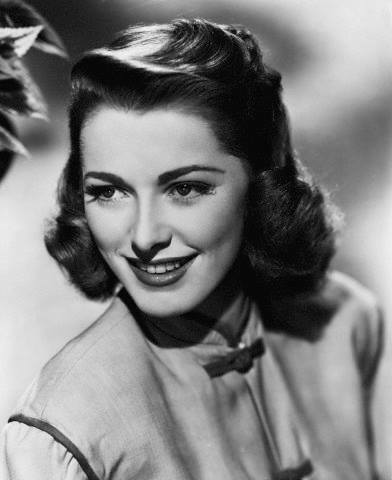 Born in Ohio, Parker moved to Hollywood in 1942 and was discovered while sitting in the audience at the Pasadena Community Playhouse by a Warner Brothers talent scout, according to Glamour Girls of the Silver Screen. Parker’s first role was in 1941, a deleted scene in the Errol Flynn and Olivia De Havilland film “They Died With Their Boots On.” This role was followed by short films, bit parts and B-movies. One of these early jobs included a voice on a record to a soldier husband in the Cary Grant war film, “Destination Tokyo” (1943). But her first major role with Warner Brothers was alongside John Garfield, Sydney Greenstreet and Paul Henried in “Between Two Worlds” (1944). The all-star cast is on a boat in the afterlife; waiting to see if they will go to heaven or hell. Her next major role came in the romantic World War II drama, “The Very Thought Of You” (1944) with Dennis Morgan as her romantic co-star. Beulah Bondi and Henry Travers as Parker’s parents, who vehemently disapprove of her romance and eventual marriage to a soldier. 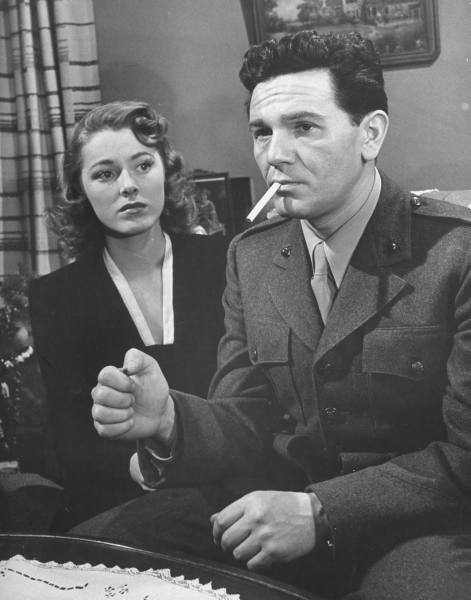 Parker showed her versatility as an actress from films like “Pride of the Marines” (1945), a drama about disabled war veterans co-starring John Garfield, to “Never Say Goodbye” (1946), a comedic romp set around Christmas with Errol Flynn. A year later she was getting drunk on tequila and flirting with Fred MacMurray in the comedy “Millionaire For Christy” (1951). John Garfield, Clark Gable, Stewart Granger, Kirk Douglas, Glenn Ford, Errol Flynn and Humphrey Bogart are just a few of the top leading men she acted with. -“Detective Story” (1951) –Parker plays the wife of Kirk Douglas who was involved with and got pregnant from a racketeer before their marriage. -“Interrupted Melody” (1956) –the biographical film about Australian opera singer Marjorie Lawrence who becomes paralyzed due to polio. She also played a woman with multiple personality disorder in “Lizzie” (1957), the same year Joanne Woodward played a similar role in “The Three Faces Of Eve.” It was Woodward who won the Oscar that year. In a 1988 interview, she said she was a character actress. That her roles were too diverse that her own personality never “emerged on screen,” according to an article from USA Today. McClelland’s book suggests one reason Parker is forgotten today is because of her quiet, private life. “I’ve prided myself on not dreaming up tales to see my name in print,” McClelland quotes her as saying in an interview. Some of my personal favorite films of Parker’s include: “The Voice of the Turtle” (1947), “Woman in White” (1948), “Never Say Goodbye” (1946), “The Very Thought of You” (1945), “Pride of the Marines” (1945) and “Valley of the Kings” (1954). 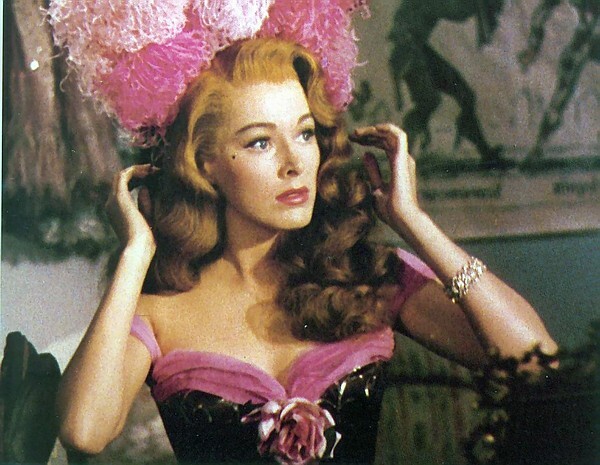 Eleanor Parker is one of those actresses that lights up the screen and makes the movie. The only films I remember not enjoying of Parker’s were the Rudolph Valentino biopic “Valentino” (1951) and “The Oscar” (1966). Neither of the films were bad because of Parker, but bad script writing. Parker passed away today at the age of 91 due to complications from pneumonia, according to the Associated Press. Goodbye to one of Warner Brothers’ brightest and most talented stars. “The Very Thought of You” will always make your fans smile. This entry was posted in Star Deaths and tagged Baroness, Eleanor Parker, Sound of Music by Jnpickens. Bookmark the permalink. Thanks for this lovely tribute to this talented actress. My own favorites of her roles were ‘Interrupted Melody’ and ‘The Naked Jungle’ with Charlton Heston – she’s both dignified and passionate in that one, suggesting so many complex layers to her character. She really was so versatile. I haven’t seen the Naked Jungle yet, but hope to see it soon! Lovely tribute. Eleanor looked absolutely stunning in all her color films. One of my favorites is Escape from Fort Bravo . A great tribute to a wonderful actress. Thanks! She died on my birthday. Not that this has anything to do with anything, but I couldn’t help but notice. Good god, she was beautiful. And Mr. Plummer’s words have a lot of weight. I remember her in The Sound of Music; I know that I saw some of her other films, but can’t think of them off hand. Thank you for dropping by and reading 🙂 I’m glad you enjoyed it!